We are full! Thanks to all the artists who were as excited about this location we were. Still interested? There is a wait list at info@mtairyartgarage.org. We’ll get back to you should there be an opening. Again, thanks for your support and enthusiasm. This is going to be a GREAT show! Saturday, Dec. 16 and Sunday Dec. 17, Sat. Noon till 6 pm, at (drum roll!) 7165 Germantown Ave. (19119). Yes, we’re going to be spreading some serious holiday cheer on the avenue. Join us as we pop up for the Holidays! It’s our 9th Annual Holiday Market — with the best pop-up location ever! Local fine art and handcraft, your original artwork, will be right in the thick of a holiday celebration that neighbors love to attend. We’ve got singer songwriters in the mix, music, food to taste, goodies to sip…it’s a community of holiday fun! So don’t miss this opportunity to reach an even larger audience. This year, we will be popping up right on Germantown Ave. where folks will be peering through the windows just waiting to get in. And we are offering an incredible price for two days that can’t be beat — $100 for members and $150 for nonmembers (with a comp’d MAAG membership)! Sharing a table with another artist is OK too! We’d love to have you in the mix. We are now full, and no longer taking applications. Should you want to be on our wait list, please contact us at info@mtairyartgarage.org. 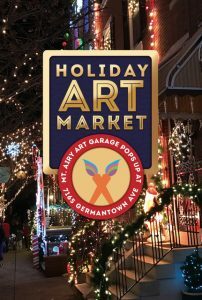 You can also mail in your check or stop by our gift shop at 6622 Germantown Ave. Any way you do it, you won’t want to miss selling at this well attended and exciting holiday show!